From the outhouse to the White House, the best toilet brushes never bristle when it comes to cleaning the latrine. Combining carefully engineered ergonomics and sometimes surprising style to produce spotless results where it counts the most, these 15 concept designer toilet brushes won’t drop the ball when you drop a deuce. 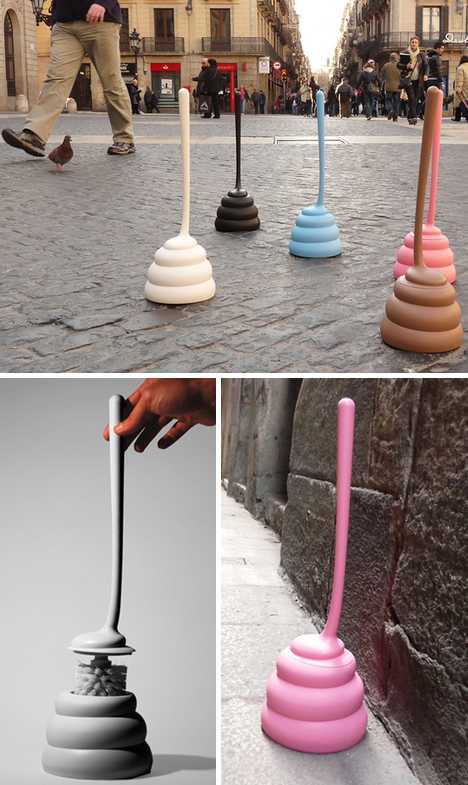 The Ballo Toilet Brush was designed for Normann Copenhagen by Jozeph Forakis, an alumnus of Domus Academy in Milan and the Rhode Island School of Design. As the latter was where the members of Talking Heads first met, it’s really no surprise Ballo (which means “dancing” in Italian) merrily wobbles around the bathroom thanks to its atypically rounded base. Big suit not included. 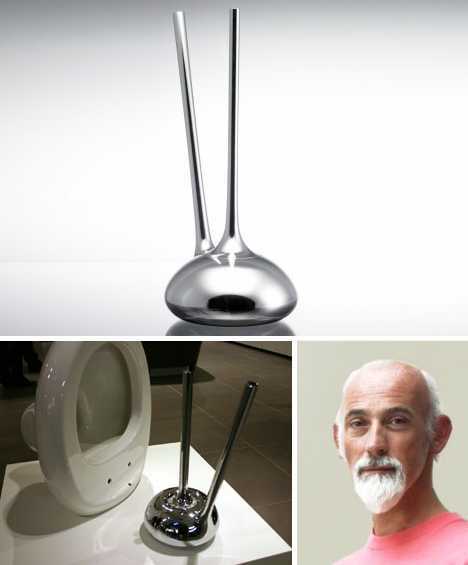 “Ballo is a different, amusing and happy toilet brush,” states Forakis, who’s undoubtedly the first to describe a toilet brush as being happy. 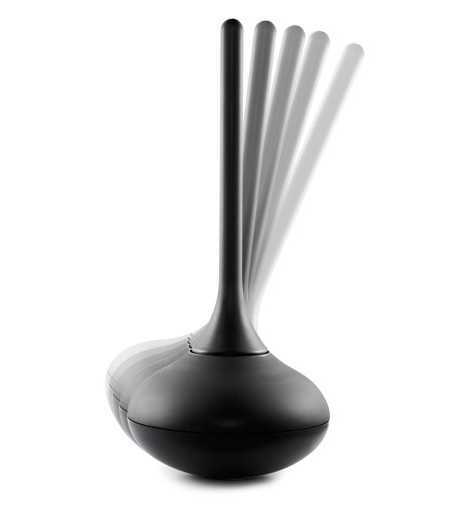 Forakis goes on to describe Ballo as “a funny but functional product that creates pleasure and gives an experience in people’s daily lives.” Having a toilet brush & holder dance around the bathroom whilst one answers the call of nature would be a very special experience indeed. 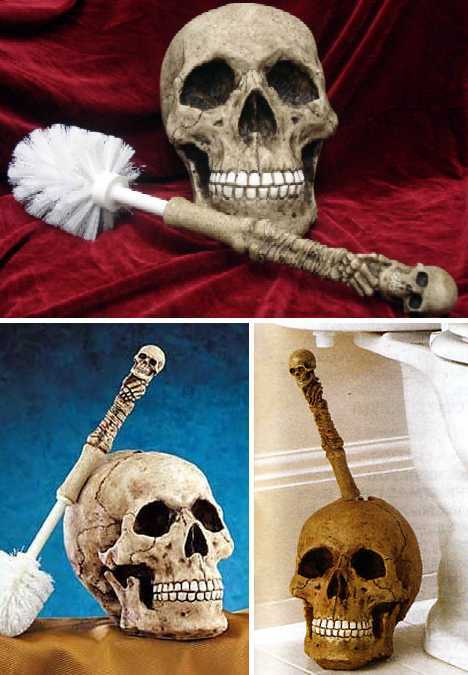 You don’t have to be One-Eyed Willie to own the Skull Head Toilet Brush Set but no Goonie geek worth his doubloons would be caught without one. The set includes a “life sized skull” and the matching handle (topped with a voodoo-mini-skull) detaches so replacing a worn-out toilet brush is as easy as plundering an unarmed merchant frigate. Arrr, scrub those decks AND the toilet, ye scurvy dog! Pants on fire? Yes please! Pinocchio must’ve really told a whopper to get himself in this sort of fix. 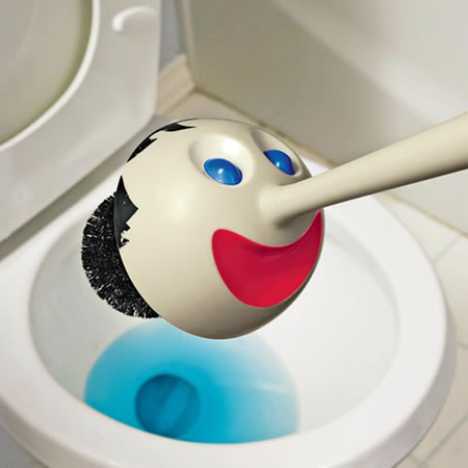 Designed with a red, blue or green hat for a base, the Pinocchio Toilet Brush “nose” just what to do when unsightly stains rear their ugly head… and that’s the truth. 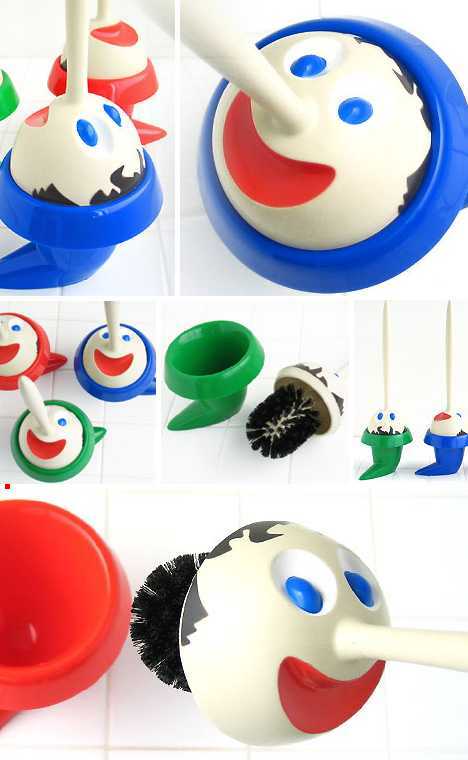 Anthropomorphic products are appealing to some, off-putting to others and the Pinocchio Toilet Brush is definitely one of those love-it-or-hate-it items. “If there is such a cute restroom brush,” suggests the sales copy at the Japanese product page, “the cleaning seems to become fun.” Oh really? Methinks some noses may be growing at a certain ad agency. The Clean as a Whistle Bathroom Brush adds a dash of pastoral charm to any bathroom. 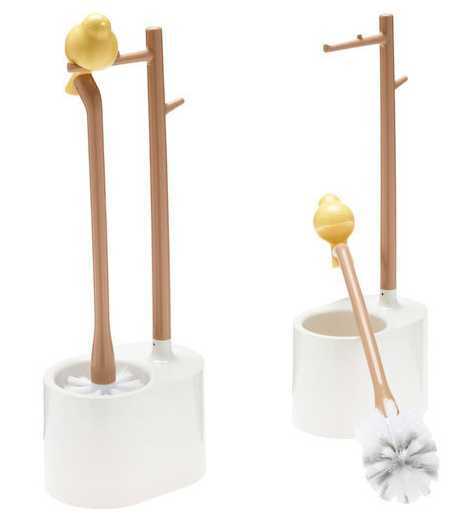 Modeled after a songbird sitting prettily on a tree branch, the design employs a second faux branch to act as a hanger for the handle thus suspending the toilet brush and keeping the brush head high & dry. Ideal for those social media addicts (and you know who you are) who can’t resist “tweeting” anywhere and anytime. 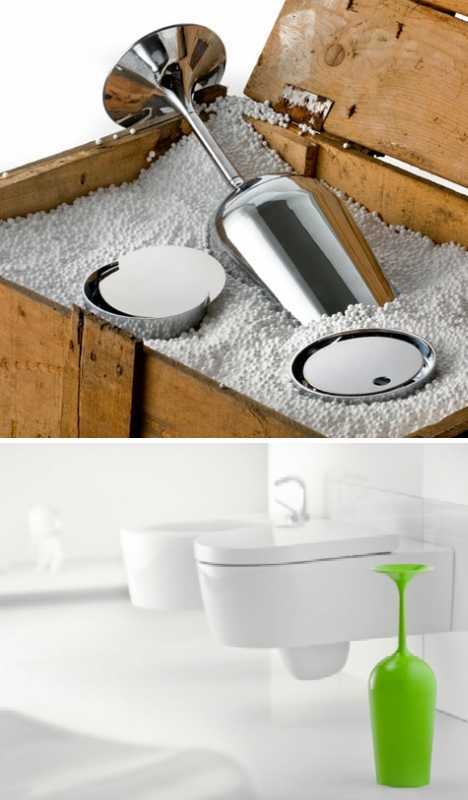 One doesn’t usually associate bathroom cleaning supplies with fine wine but Antonio Gardoni isn’t your usual designer. His FRAGILE Toilette Brush cleverly masks a functional toilet brush within a plastic shell modeled after an upside-down wine glass. Of course, should you overindulge on the bubbly and find yourself driving the porcelain bus, a wine glass is probably the LAST thing you want to see. FRAGILE is one of Gardoni’s “5 Collection”, designed to “transform an ordinary bathroom ‘visit’ into an unforgettable experience!” Fine, but what if you’re drinking to forget? The Istanbul (not Constantinople) WC Brush Holder is one heavy hitter: 4.13kg or 9.1 pounds to be exact. Designed by London-based industrial designer Ross Lovegrove for the Turkish brand VITRA, the WC Brush Holder exhibits a smooth, rounded shape that works well with today’s organic inspired appliances. 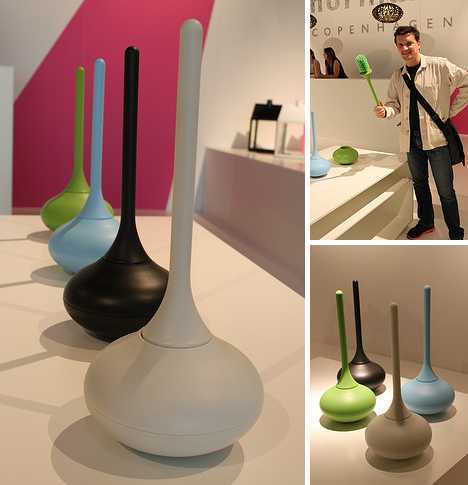 There’s not much that can be said about the KaKaK Toilet Brush besides the fact it was designed in 2012 by Jordi Pla of Jordi Pla Studio S.L for Homewood International of Taiwan. Then again, one might say the design speaks for itself and any description would be redundant… not to mention repugnant. 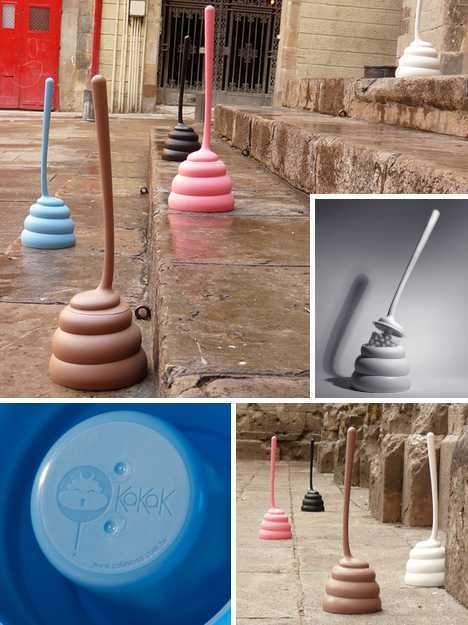 The KaKaK Toilet Brush comes in your choice of black, white, blue, pink and brown (of course). Made from molded polypropylene, the in-your-face design makes sure you make no mistake when fumbling for your toothbrush after not getting enough sleep the previous night. Nina Tolstrup of Studiomama exercises her creative muse by repurposing wood. The Skittle Brush is just one example. Named and designed after Skittles, the old European sport ancestral to bowling, this sleek and slender organically curved toilet brush allows you to strike and stains, sparing no messes. 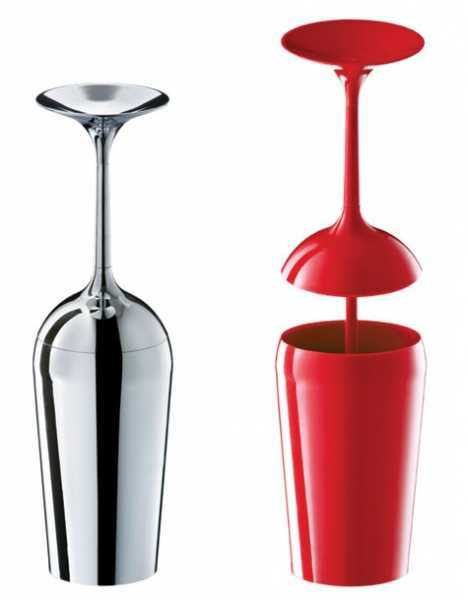 We’re not sure if it’s intentional or not but the Merdolino Toilet Brush from Alessi seems to be named after “merde”, the French word for poop. 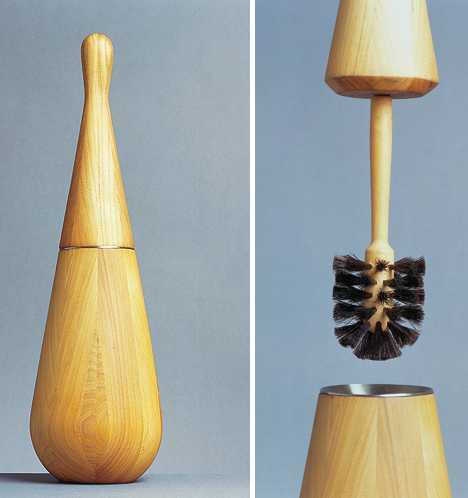 Designed by Stefano Giovannoni in 1993, Merdolino turns the humble toilet brush from a utilitarian object to a decorative accessory. A subtle variation on Merdolino sees the budding branch replaced by a slender Saguaro. 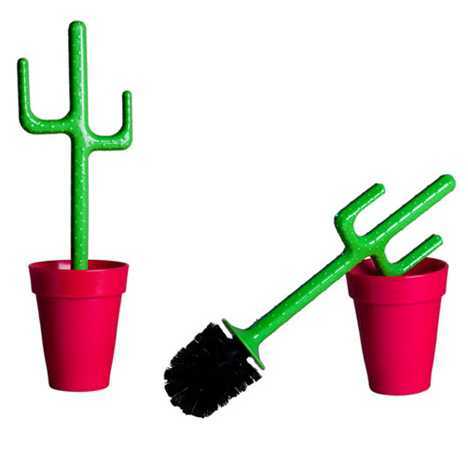 Now if only they could replace the brush head’s bristles with real cactus thorns. Mesquiteolino, anyone? Those “pot of gold” jokes you’ve been saving up? Let ’em rip, ’cause the $525 Rock Star Toilet Brush Holder has entered the building! 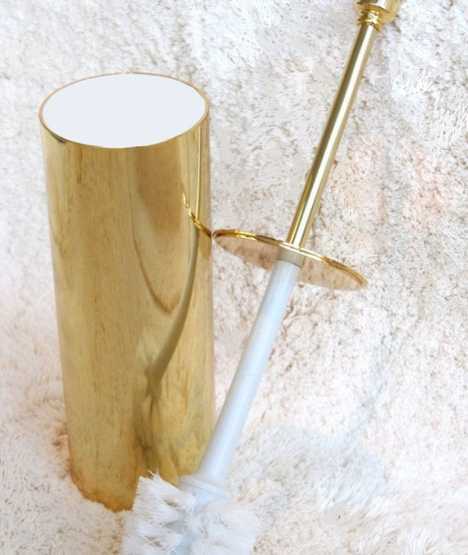 Designer Windisch Nameek plated an otherwise unremarkable toilet brush handle and cylindrical holder in 24-karat gold for the very commonsensical reason that pure gold won’t corrode, pit or tarnish. Which raises the question… if you can afford $525 for a freakin’ toilet brush, why not just gold-plate your toilet so you’ll never need to use one? 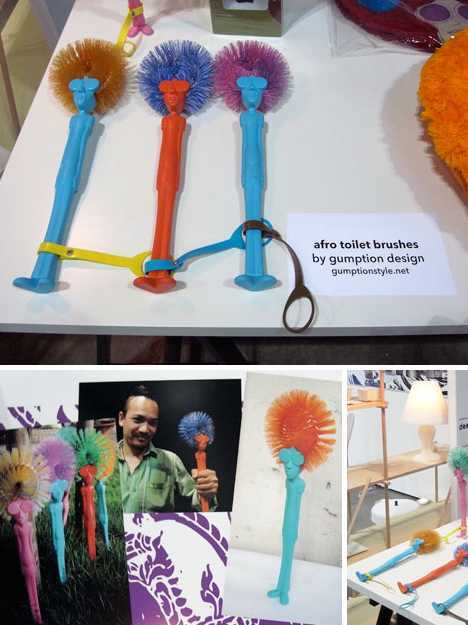 Gumption Design is based in Thailand, and that’s as far as we’ll go lest Spike Lee sees these so-called Afro Brushes and fires off another errant tweet. According to GD’s sales copy, what we have here is “a brush with a 70s afro look, the handle of the brush is in the form of a cool ‘hippy’” See, only cool hippies need be offended. If you can get past the, ahem, distinctive design of the handle, what you’ve got here is a fun & funky… no, that’s not right. 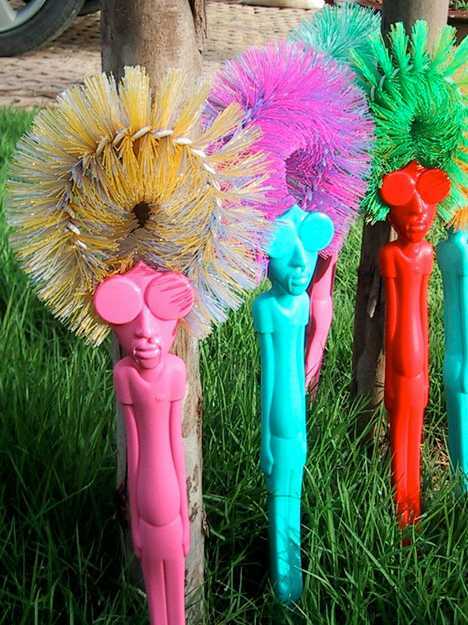 OK, these day-glo plastic psychedelic toilet brushes add a little color… forget it, we give up, gonna quit while we’re a head. Doh! Also known as the Child-Proof Toilet Brush, the Kleinkindsichere WC-Bürste is an idea whose time has come – just like curious toddlers who can come into any room at any time and get into a heapin’ helpin’ of toilet brush-related trouble. 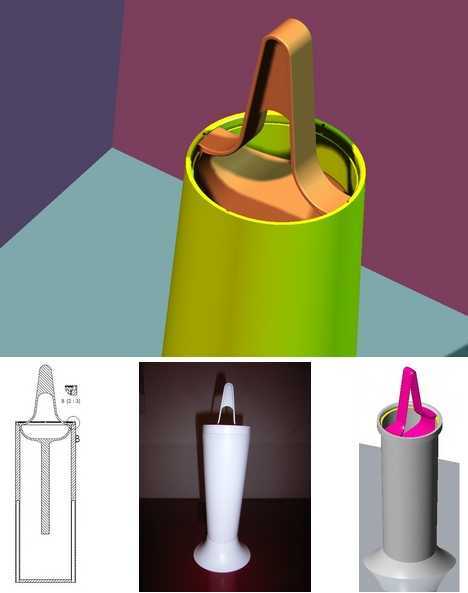 Then there are the dogs who see “toilet brush” and think “big white bone!” German designer Peter Praktisch has a solution, one that will be very familiar to anyone who’s tried to remove a child-proof cap off a bottle of pills. 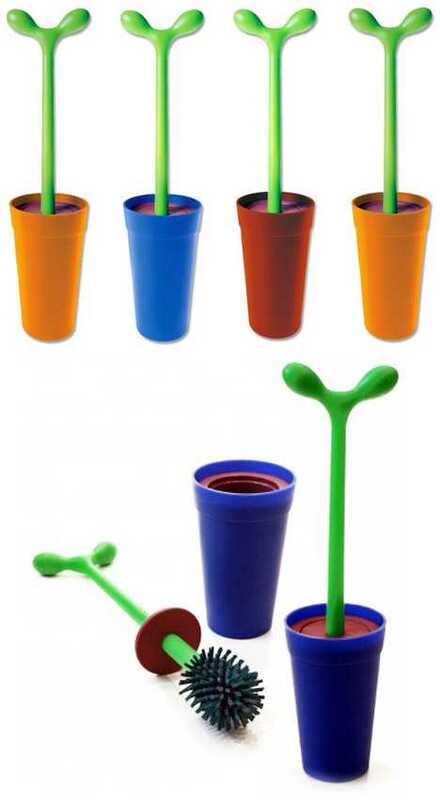 Of course, if you have trouble with those than your bathroom will reflect it. Does your toilet’s criminally encrusted condition call for a special kind of cleaning agent? 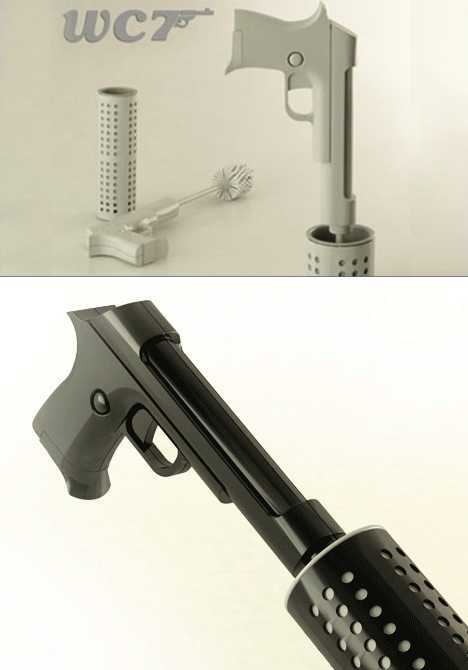 Then call on WC7, the electric toilet brush whose orders are “shoot to clean.” Designed by Francesco Castiglione Morelli with Annamaria Carelli, this is one polishing potty pistol that will leave even the most evilly stained commode shaken AND stirred. Lock (the bathroom door) and load! The WC7 packs a pair of AA batteries in the brush’s handle. 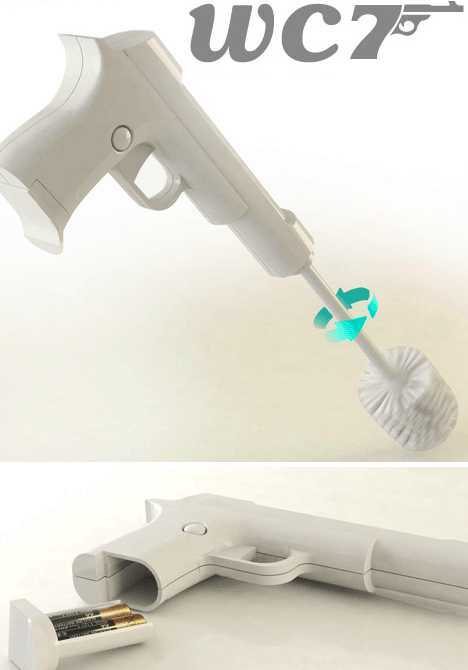 Once installed, take careful aim and pull the trigger… the spinning brush head will eradicate those stains faster than Don Corleone erases his competition. Now there’s an offer nobody can refuse. 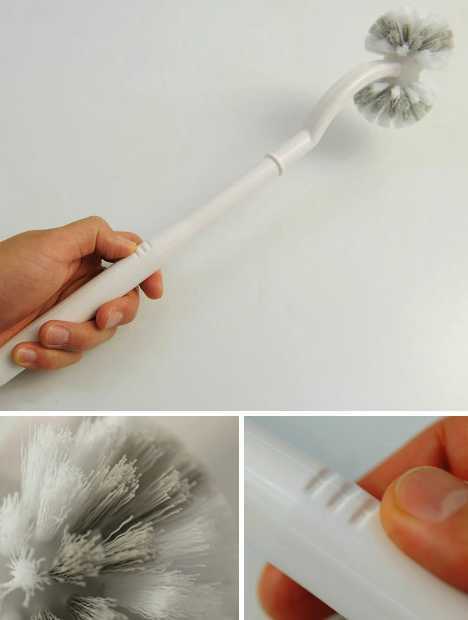 Designer toilet brush? Why ask why when you can DIY! 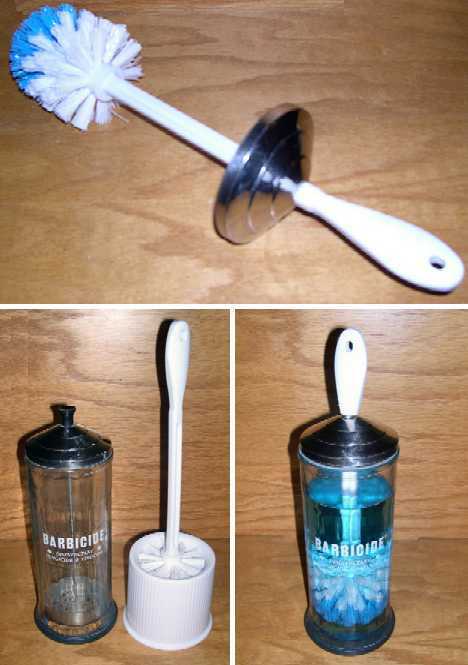 The clever lads at MAKE Projects combined a classic barbershop glass Barbasol container with a standard toilet brush to create this awesome self-disinfecting toilet brush & holder that ends up being much more than just the sum of its parts. Er, you might not want to store your combs in there once it’s been re-purposed and used, though. 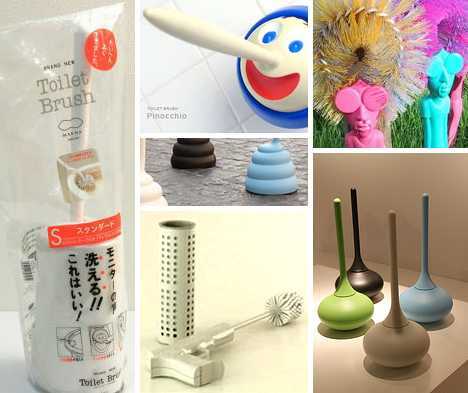 It takes a pair of big brass ones to dub your new toilet brush “Toilet Brush,” as if any and all other such devices are suddenly, hopelessly irrelevant, and Japanese housewares company Marna seems to have ’em. Their new & improved product has been re-designed from handle to holder to be THE best toilet brush EVAR… and give Marna some credit for not calling it that. 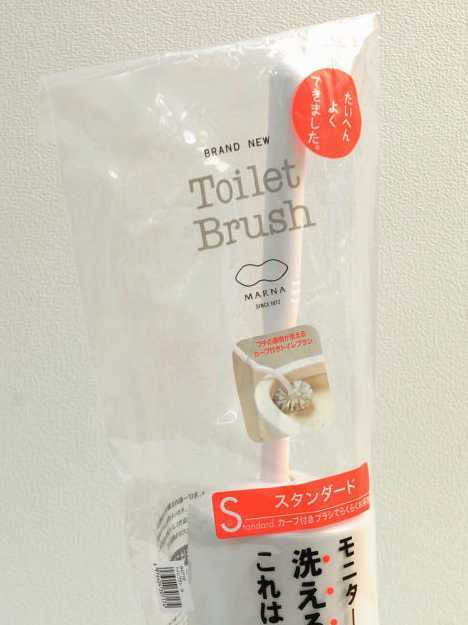 How does Marna know their brand new Toilet Brush will please their target market of finicky Japanese housewives? They asked them, of course: the company brought in 200 average housewives and asked them how the humble toilet brush could be improved. It was a smart move and besides, who’s gonna tell 200 housewives they’re wrong? Suggestions ranged from incising grooves on the handle to help secure the grip, using both hard and soft bristles on the brush, and engineering a floating holder design that keeps the brush head high & dry between uses. 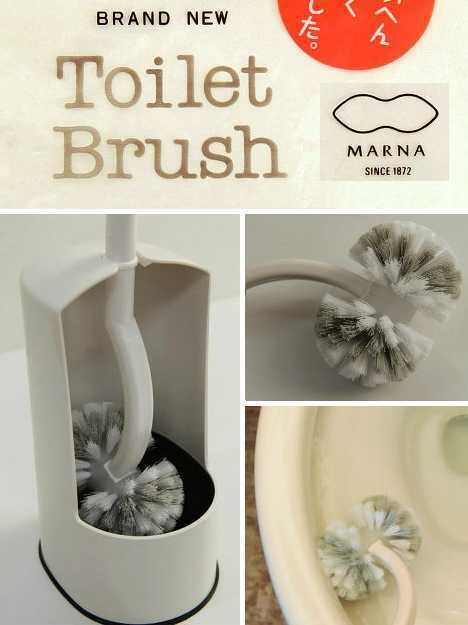 Now if only they could re-design the toilet itself so toilet brushes aren’t necessary, suggested one Marna employee just before he was, er, canned.